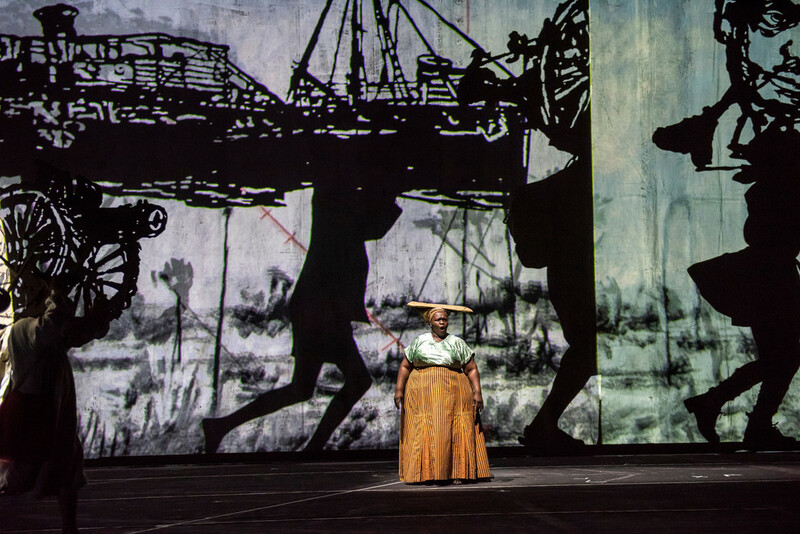 Wiliam Kentridge, The Head & The Load. Performance view, Park Avenue Armory, 2018. Photo: Stephanie Berger. THE SIREN RISES IN A LONG WAIL. It climbs through the darkness, sounding the alarm that The Head & The Load has begun. At first, the tinny signal of distress seems to emanate from a machine, but as it swells, it modulates into a multitude of voices of varying timbres, and vocalist Ann Masina, her mouth open in full-throated song, is spotlighted. The noise subsides, a pause to register that it is humans who summon us: not a machine. And from that small correction of understandingthe invitation to distinguish between a person and a toolwe are called to remember the difference between a human and an instrument of capital. The Head & The Load, a nearly ninety-minute multimedia production featuring several dozen actors, dancers, singers, and musicians, including the Brooklyn-based orchestra the Knights, presents the instrumentalizing logic of imperialism pushed to its most violent extremes by the dictates of war. It acknowledges the role of nearly two million Africans who served in WWI and commemorates the death of an unknowable number, probably a million or more, many of whom fell as porters, carrying the white man’s burdens. The performance meditates on cold accounting, the sort that abbreviates an individual to a pair of walking legs, and a head to a platform for a load. It liquidizes people into streams of figures when they can be useful but fails to tally or bury them when they die as “wastage.” This is the “advanced arithmetic” of the European in Africa, a dehumanizing impulse so embedded in whiteness, so totalizing and so culturally uniform an attitude that source material for this ambitious performance is horrifically rich. 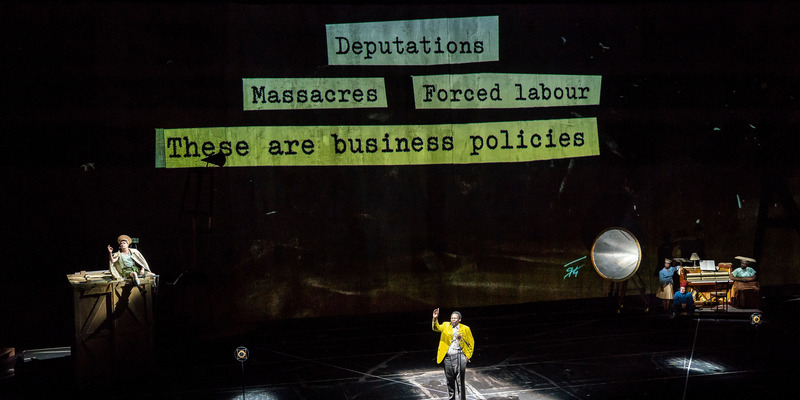 A team of South African collaborators (artist and director William Kentridge, composer Philip Miller, co-composer and musical director Thuthuka Sibisi, and choreographer Gregory Maqoma) rally a pan-African chorus of thinkers and dancers to nudge this calculating mindsetmaterialized in projected images of ledger books of cost and profittoward an ethics of accountability. Their lament, by turns indignant and weary, is a campaign to wrest personhood from colonial commanders who demand their backs scratched (“that is too hard! that is just right . . . oooooo, aaaaa”); their breakfast served (“plenty of eggs, cream, and asparagus”); their weapons of destruction carried. Against this backdrop of narcissism, mosquitoes, and death, The Head & The Load draws on a rich multitude of cultural forms: the frenetic stomping and pennywhistle dances of the Witwatersrand mines; the haunting rhythms of the Guinean kora player N’Faly Kouyaté; the terse wisdom of Sol Plaatje; such archival sources as John Chilembwe’s 1914 letter to the Nyasaland Times; Franz Fanon translated into SiSwati; as well as shadow play and live animation. African war chants meet European waltzes. These form a collage of overlapping voices: sighs, wails, and beautifully articulate grievancesa patchwork of torn-up letters, stolen songs, and revolutionary dances. The animal howls and bloodcurdling shrieks are left to the “civilized” Europeans who bark and spit, their faces disfigured by the sneer of power. (Joanna Dudley, cardboard eagle atop her head, is fantastic as the deranged Emperor Wilhelm II). Their language descends into the nonsensical stutter of Kurt Schwitters’s Ursonate, 1932; their “rationalism” disintegrates into the rat-a-tat-tat of machine guns. This is an unforgiving picture of Europe. It is the accusing stare of Euro-Africans unwilling to indulge the illusion that the colonial presence in Africa wrought anything but a self-serving extraction of resources, an attempted destruction of its cultures, and the mass murder of its people. These Europeans are the angels of death. 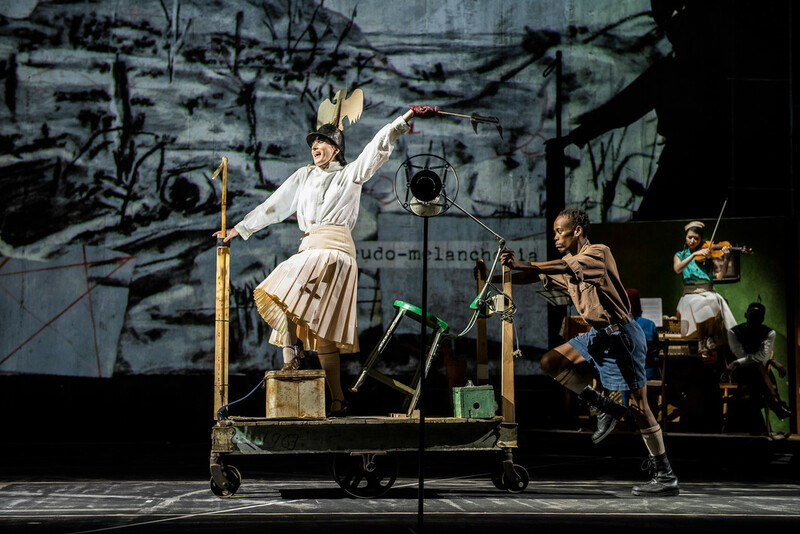 Wiliam Kentridge, The Head & The Load. Performance view, Park Avenue Armory, 2018. From left: Joanna Dudley, Xolani Dlamini, and Mario Gotoh. Photo: Stephanie Berger. The air-raid siren is a warning of what will come. But it’s never enough, and it’s almost always too late. Hearing it (as a passively seated audience member in a dark room on a New York winter’s night) only reminds us of our inability to stop what will follow: that we are largely subject toand not, pace Hegel’s imperial proclamations, subjects ofhistory. As were those swept into the bloody folly of WWI, especially the hundreds of thousands of forcibly recruited Africans. The alarm rouses us to alertness, a little Brechtian in its call, but to what end? Is it our present passivity to the destruction of our future or our complicity with the erasures of the past? Drumsticks become searchlights; landscape becomes a graveyard. A century later, the African dead still lie unburied, their contribution unacknowledged, while late capitalism thrives globally. We hear the tale of the disassembly and transport of a boat halfway up Africa, from Cape Town to Lake Tanganyika. This is a story of the resilience of the human body that survives where machine and beast fail, marching on when the train tracks end and the oxen die of tsetse flies. And it allegorizes what it is to be a porter: not only to be a load-bearing instrument but also to carry the weight of the boat you have missed, whether self-determination, the historical record, or the right to humanity itself. 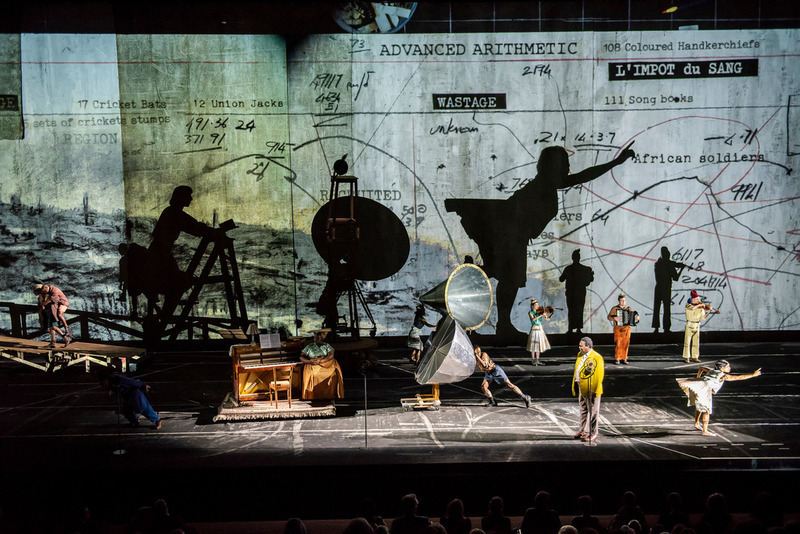 Wiliam Kentridge, The Head & The Load. Performance view, Park Avenue Armory, 2018. Ann Masina. Photo: Stephanie Berger. Kentridge has long drawn, projected, and sculpted porters. Sometimes they are Atlas figures, doubled beneath the world heaved on their shoulders; at other times, they form marching processions, as they do in The Head and The Load, carrying doves of peace and portraits of the missing to the elegiac strains of the kora. Their relentless walk suggests history as a processiona narrative chain, a parade of imagesas does the form of the performance itself: a forceful succession of multiple vignettes. Yet it is the inevitability and triumphalism of the march that we are prompted to unwind, to unspin, to scatter. Drawn animations of bits of paper fluttering down the stage set model an image of history as a roughly torn collage. Their frayed edges emphasize collage as an act of tearing, and the implicit violence of ripping not only produces The Head & The Load’s visual and aural forms of fragmentation (the snippets of the libretto and musical score) but also evokes the process of shattering cultures, rupturing families, and the trauma of cleavage that rendered Africa a checkerboard of arbitrarily drawn lines owned by colonial powers. This map has never been sutured; these tears run deep. The past has only just begun. The Head & The Load ran December 4–15, 2018, at the Park Avenue Armory in New York.